This equipment is used with pocket miku and make it to be able to control by CV and gate Signals. You can use packet miku as a module in your modular synth system or as a sound module of something another CV and gate based controller. Input CV is based on 1V/OCT format. It accepts from 0V to 5V. but pocket miku can get sounds only 2 octaves at a time. So this equipment have special CV limiter to make it easy to connect with your equipments each other. under around 2V, pocket miku reproduce most lower tone. but you can get something sounds. 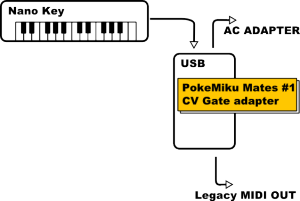 From little under 2V to over 4V can be accepted as 2 octave for pocket miku. over than that, pocket miku reproduces highest tune continuously. Pocket miku has so many parameters inside of it. you can control it from PC based system. I had chosen just simply reverb. It’s hi-quality and one of most great effect that pocket miku has. you can change its amount by knob. Many software that almost of them are free may be released from not only Gakken but also independent developers. 2 set of 3 terminal 2.5mm mini jack at the other side of the box is serial input and output ports. Because of only its style of the connector type, we can’t call it as “MIDI”. but it almost compatible with it. And this box is intended to be used with Pocket miku but this USB host port can accept USB AUDIO Class Compliant device other than Pocket miku. “MS-20 mini” or “Nano Key” from Korg can be used with this. 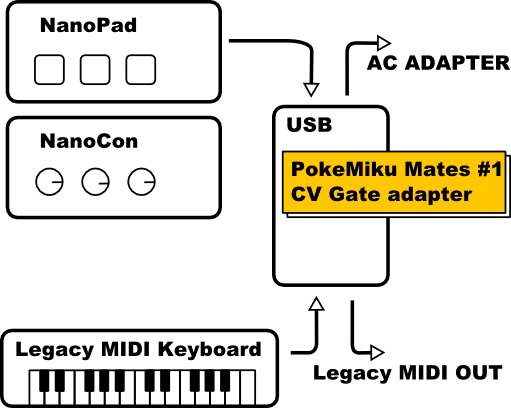 Without PCs, you can get legacy MIDI output from both of them, only using the connector converter cable with this equipments. Now it’s on developing. I’m adding or subtracting some functions of connectors to make it more easy to use. it should be coming soon! Just moments, please! this is most simple connection example that I intended basically. 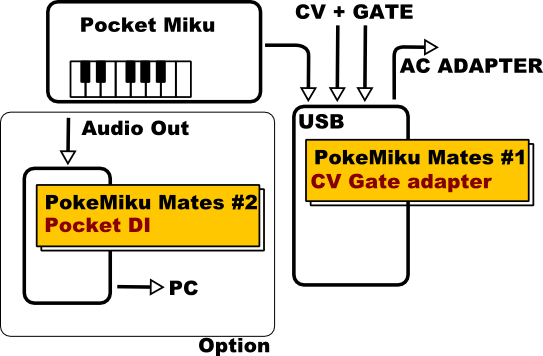 Connecting POKE-MIKU and cv gate adapter by USB cable. 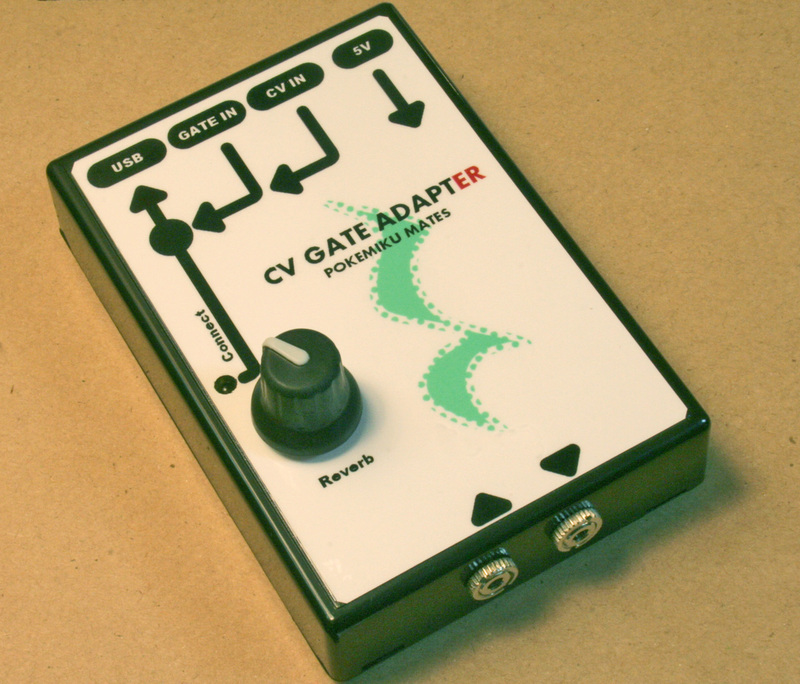 then, add CV and Gate signal to cv gate adapter. 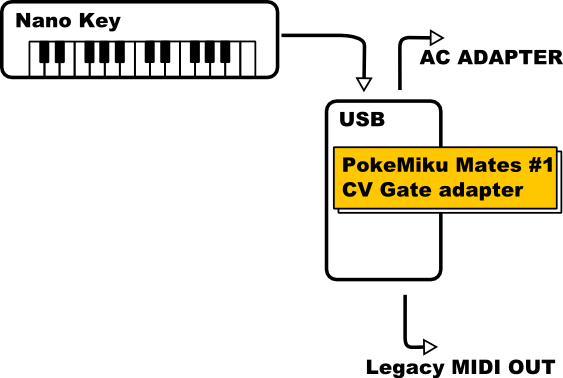 you can drive POKE-MIKU by CV GATE based system. more big ribbon controller instead of POKE-MIKU’s small pen stylus may extend your performance. 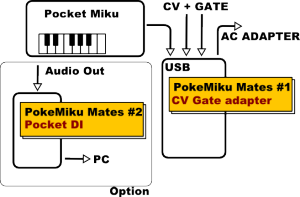 When you want to record it by your computer , use another Pokemiku mates products that called #020 Pocket DI. It may reduce the noise based on USB cable. #056 Patch Cable Type B, you can convert USB MIDI DEVICE to legacy MIDI device without using host computer. MIDI-compliant serial port is not only output but also have input. 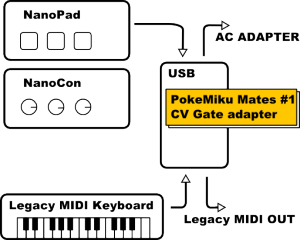 you can marge legacy MIDI output and USB-MIDI output by cv gate adapter. 2 set of #056 Patch Cable Type B may be needed for this configuration, but you can convert USB MIDI DEVICE to legacy MIDI device without using computer. We shall be released from the weight of computer at the live performance that we have. CV Gate converter may be one of the answer that we have. all the maker name and it’s products are tread mark of each of them.